Total Score: 8.17 + ULTIMATE ENTHUSIAST AWARD! 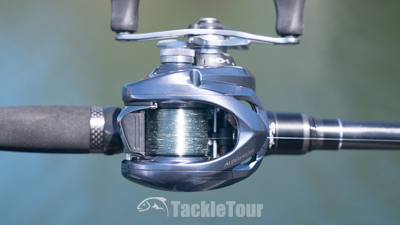 Introduction: Shimano Japan debuted the Aldebaran platform back in 2009 and the first iteration of this reel easily won this Editor's Choice Award. As Japanese reel manufacturers are one to do, once a platform becomes popular, it's time to introduce a variant and in 2014, the Aldebaran BFS made its debut. 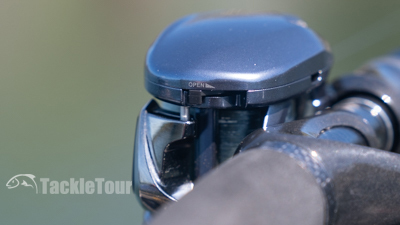 In 2015, Shimano Japan refreshed the platform and again won this Editor's Choice. 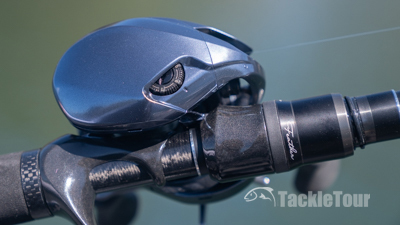 As Shimano makes an effort to globalize their product line, the Aldebaran is now available domestically demonstrating it is truly a shining star within Shimano's lineup. To be honest, I kind of lost track of this little wonder as all three versions sit in a reel cabinet in my garage unused and neglected. Instead, I've been fishing Shimano reels with three brand new initials added to the end of their product names - MGL. Each reel from this company that I've fished with this designation has delivered performance improvements akin to when I first fished a DC reel from the same manufacturer. It's almost gotten to the point that if it's a Shimano low profile baitcaster and it's not a DC or MGL, then I don't want to fish it. The Aldebaran MGL is available in two gear ratios, the standard (6.5:1) and HG (7.4:1). 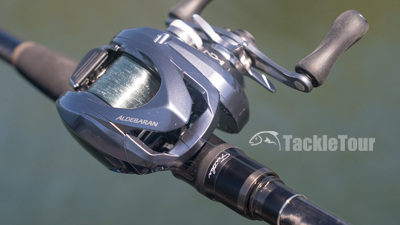 The stars have aligned for 2018 as Shimano has once again refreshed the Aldebaran and this time, with their latest wonder of casting technology. That's right, Aldebaran has received that coveted MGL designation. How much can it improve an already high performing platform? Let's find out. The spool size designation for this reel is 30 - it's shallow but you can still get a decent amount of 10lb test fluorocarbon on this reel. Impressions: The Aldebaran MGL shares the same size and shape as the previously reviewed 2015 Aldebaran 50/51, but there are differences in the reel's finish as well as spool capacity. The MGL version features a kind of metallic steel blue paint scheme that looks either grey or midnight silver depending on how bright the lighting conditions are. 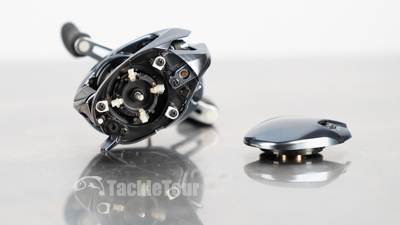 The sideplate detaches fully to grand you access to the four brakes on the reel's spool. The model number of the Aldebaran MGL is 30/31 letting consumers know this reel has a spool that is more shallow than the 50/51 from 2015. 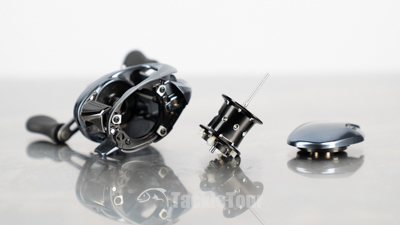 With some of their low profile baitcasting reels, a change in model number means Shimano will change the physical size of the reel along with the spool's capacity, but the true meaning behind those number changes from 200 to 100 to 70 to 50, etc, is to delineate spool capacity. Therefore, if the change in capacity is small enough (e.g. 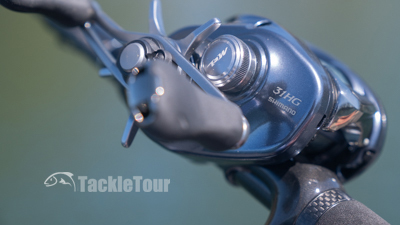 from 100 to 70 or 50 to 30), all Shimano is really doing is changing the depth of that spool. The 50/51 sized Aldebaran features a spool with 9.3 cubic centimeters of volume. The MGL's 30 size spool offers 6.3 cubic centimeters. The physical size of the two reels is the same. Spooled with 10lb Sunline Sniper Green. Real World Tests: I spooled the Aldebaran MGL with some ten pound, green Sunline Sniper Fluorocarbon and paired it with a new FTX-71MH from Phenix's Feather series of rods for its first round of our real world tests. I matched it up with Phenix's K2 TX 713C for some BFS testing in its second round. Brakes can be fine tuned via this external dial. Casting: With standard lures and lure weights, the Aldebaran MGL is a wonderful caster in presentations ranging from smooth, easy casting motions, to those quick, overhead snaps casts. Matched up with the K2 TX 713C, I was able to fish the Aldebaran MGL like a spinning reel tossing light drop shot rigs with tiny, one sixteenth ounce tungsten weights and a Missile Baits Drop Craw. To unlock the sideplate, flip this switch at the back of the reel. The bottom line, this reel is excellent in low speed pitching presentations too. The Aldebaran MGL is very capable of casting both standard application and finesse baits in whatever manner you make your casts.